Your friendship and generosity have moved us more than words can express, and for which no material gift can repay. In gratitude, Holy Mass was offered for you and your intentions. 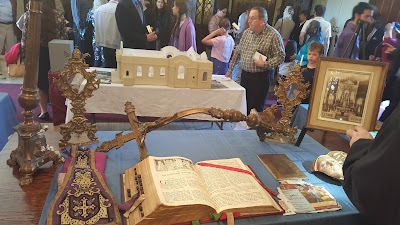 The Mass was celebrated in the chapel of the priory, adjacent to the fire-ravaged Shrine of Christ the King. Although the priory was not damaged in the fire, it did sustain smoke and water damage that required extensive restorative cleaning. Earlier this week, the priests and candidates were allowed to return to the priory after the cleaning. A Mass will be offered weekly for the intentions of all donors. Your kindness and generosity will not be forgotten. Thank you again! This prayer is similar to the Act of Consecration to the Sacred Heart. This prayer was written by Pope Leo XIII in 1889 and included in his encyclical Annum sacrum. 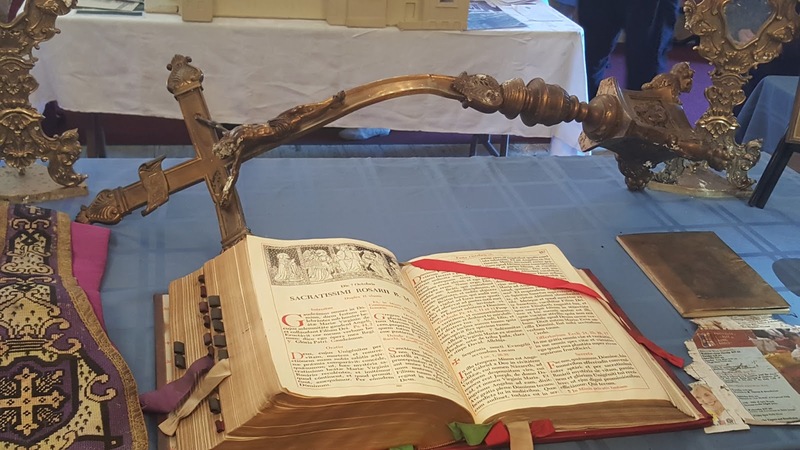 O glorious Apostle of the Gentiles, Saint Paul, who with such zeal didst busy thyself in destroying at Ephesus those books which thou knewest well would have perverted the minds of the faithful: turn upon us thy gracious eyes also at this present day. Thou seest how an unbelieving and licentious press is attempting to rob our hearts of the precious treasure of faith and spotless morals. 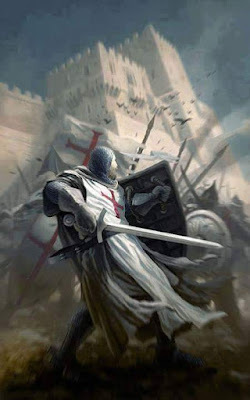 Enlighten, we beseech Thee, O holy Apostle, the minds of so many perverted writers, that they may cease once for all to do harm to souls with their evil doctrines and lying insinuations; move their hearts to hate the evil that they have done and are doing to the chosen flock of Jesus Christ. For us, too, obtain the grace of being ever docile to the voice of the Supreme Pontiff, that so we may never allow ourselves to indulge in the reading of bad books, but may seek instead to read and, so far as it is given to us, to diffuse those books which by their salutary doctrine shall assist all of us to promote the greater glory of God, the exaltation of His Church and the salvation of souls. Amen. Last week's devastating fire destroyed the entirety of the Shrine of Christ the King in Chicago. The Shrine is my spiritual home, so I have personally felt the trial from this loss. Despite this great trial, there have been consolations. Last Sunday a Solemn High Mass was said at the neighboring St. Thomas the Apostle Catholic Church. On display were a number of items salvaged from the fire-ravaged building. The images of them are below. Please say a prayer for the Shrine's priests, the Faithful who call the Shrine home, and the neighboring community. Please consider making a donation to help this monumental rebuilding using the Shrine's Go Fund Me. 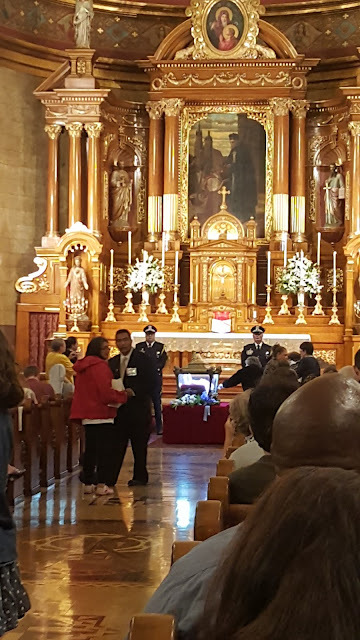 Last night I was privileged with the grace of venerating the sacred remains of St. Maria Goretti, the youngest canonized saint in the Church and the patron saint of young people. St. Maria Goretti's story of forgiveness is powerful - consider how she forgave her attacker who brutally stabbed her and how she prayed for his soul. Her attack, Alessandro Serenelli, would later while in prison receive a vision of St. Maria Goretti. As eyewitnesses testify, his entire disposition afterwards was changed and he spent his remaining life in penance. After spending nearly 30 years in prison, he was released and became a Third Order Franciscan and begged the mother of St. Maria for forgiveness. Like her saintly daughter, the mother forgave the murderer of her own child, in imitation of the mercy of Jesus Christ. Alessandro testified in favor of St. Maria Goretti's canonization. It was the first time in Church history that the murdered did so. 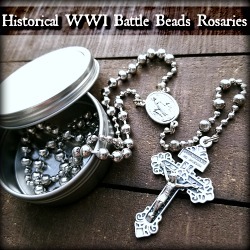 It was also the first time that a saint's mother attended her daughter's canonization. And in another first, it was at the time - in 1950 - the largest attended canonization in history with over 250,000 people in attendance. 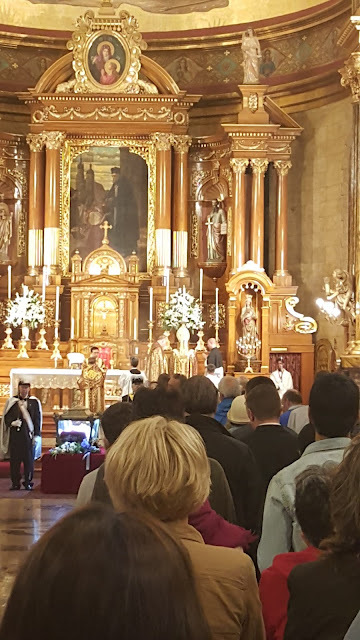 Last night, at 7:30 PM a Pontifical Solemn High Mass was said by Bishop Joseph Perry, auxiliary bishop of the Archdiocese of Chicago. The church of St. John Cantius was filled beyond capacity with crowds gathering outside and around the building. 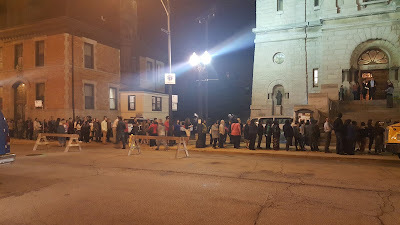 More than 2,000 souls were present for the Mass and original estimates were for 20,000 to come to the parish to venerate her body during the 24 hours of public veneration. 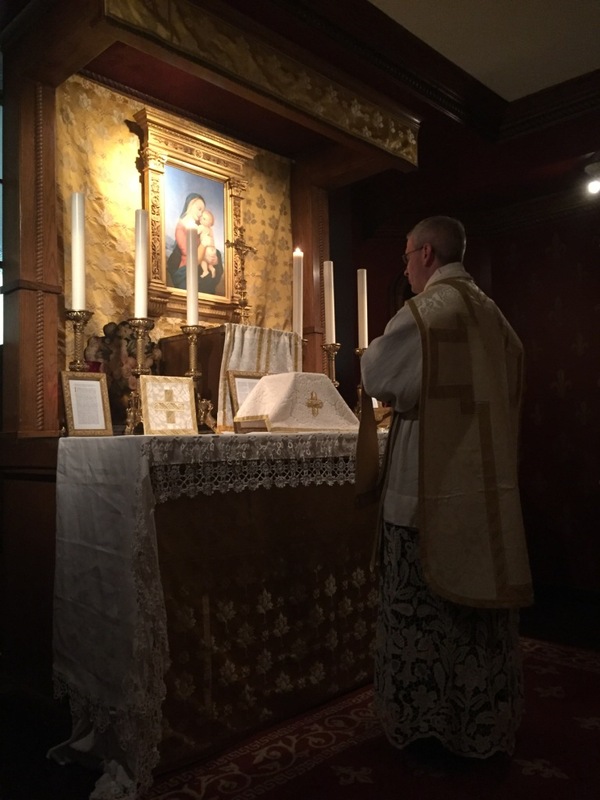 The Mass was so well attended that Bishop Perry had to even perform a second consecration. St. Maria Goretti, pray for us. Pray for our world. Pray for us to learn forgiveness. Pray for us before the face of the Lord, who you now behold face to face. You, O Holy Saint, chose to sacrifice your body to save your soul. 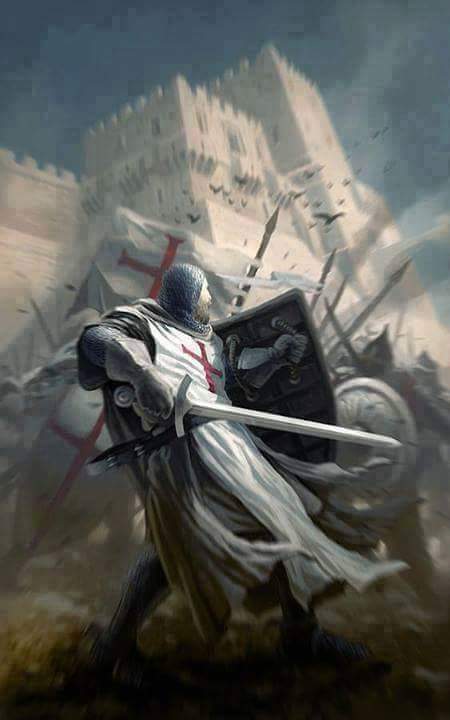 May we have the courage to do likewise in the face of adversity. And may Alesssandro Serenelli, the repentant murderer, who lived the remainder of his life in penance and reparation, have received forgiveness he sought. May he too be raised to the glory of sainthood and serve as a model for all of us sinners. 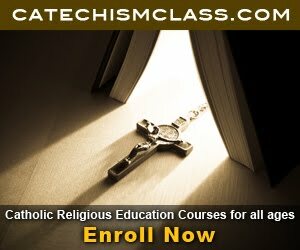 Learn if the body of St. Maria will be in your area by clicking here. Yesterday a devastating fire destroyed much of my spiritual home, the Shrine of Christ the King. This loss is especially profound as the Shrine has been under renovation since 2004 and was in its 3rd and final stage of restoration. I ask for your prayers and support on behalf of the Shrine of Christ the King, a beautiful Shrine that has exclusively offered the Tridentine Latin Mass now for over a decade. 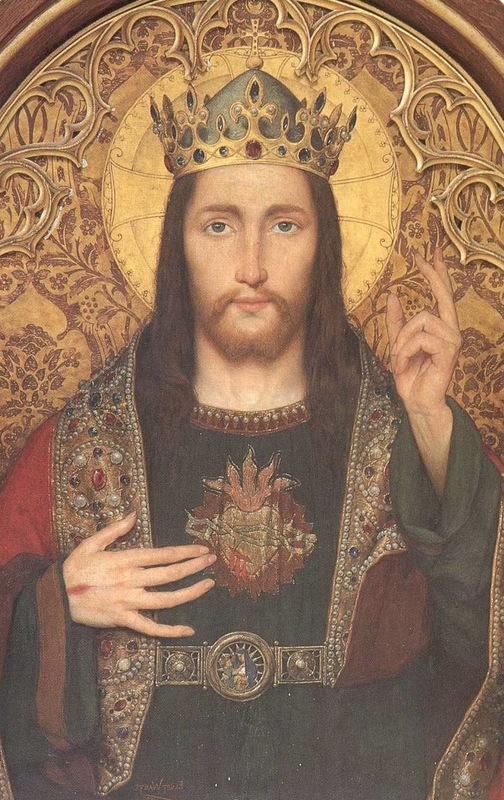 Please click here to donate to the Shrine of Christ the King - donations are very much needed at this time. 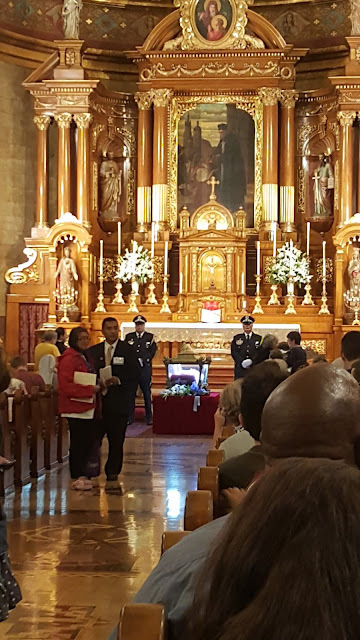 Hours after the last flames had been put out, a firefighter walked down the blackened steps of Shrine of Christ the King Church on Wednesday and handed over a statue covered in gold vestments and topped with a crown. The statue, known as the Divine Infant Jesus, was made in Spain in the 1700s. It was presented to the 92-year-old church in Woodlawn 10 years ago after the church was spared the wrecking ball and the parish began the long work of restoration. Smudged but otherwise undamaged, the statue survived an extra-alarm fire overnight that was touched off by renovation work and severely damaged the roof and interior, according to fire officials. 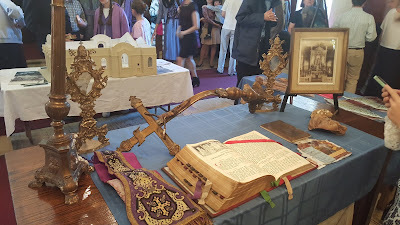 To the priests of the parish, it symbolized their intent to rebuild again. "The statue is the spiritual centerpiece of our shrine and its community, so people really spiritually identify with it," said the Rev. Matthew Talarico. "It's iconic to symbolize all the work and the mission that we do at the church," he said. "It's important that people see that this has been preserved from past years, and this is the first step on the journey forward and that Christ is still with us." Inside the church, charred rubble covered the floor and water soaked the walls and pillars inside. Most of the roof was gone. But Talarico remained positive, emphasizing that the parish will still have Masses and carry on other services. "The message is that you need to have Good Friday before you can have Easter Sunday," Talarico said with a laugh. "We're not starting all over again. This is just another chapter. Our community is here, and we will continue to move forward step by step together. Sometimes circumstances like this bring people even closer together because that common goal really unites us in Christ and with each other. 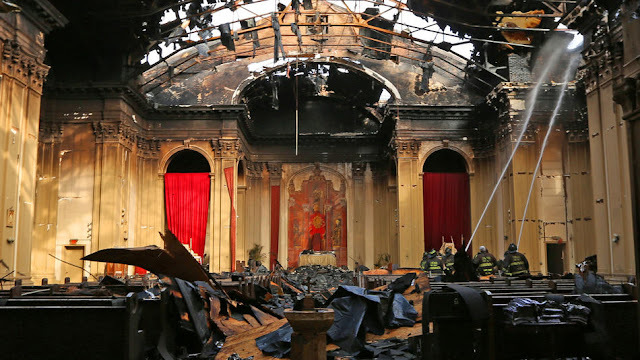 "We won't miss a beat," he said, noting that the church has escaped destruction before. 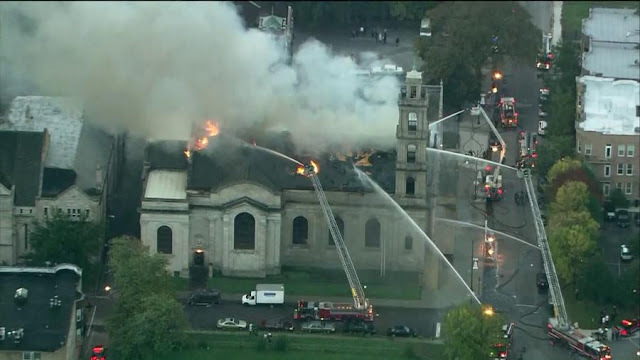 It is still early to know the full extent of the damage but the Shrine of Christ the King in Chicago, served by the Institute of Christ the King, where I personally attend Mass, has been destroyed by fire. The roof, according to firefighters, will collapse. Thankfully no one was injured and the historic Infant of Prague state was saved. 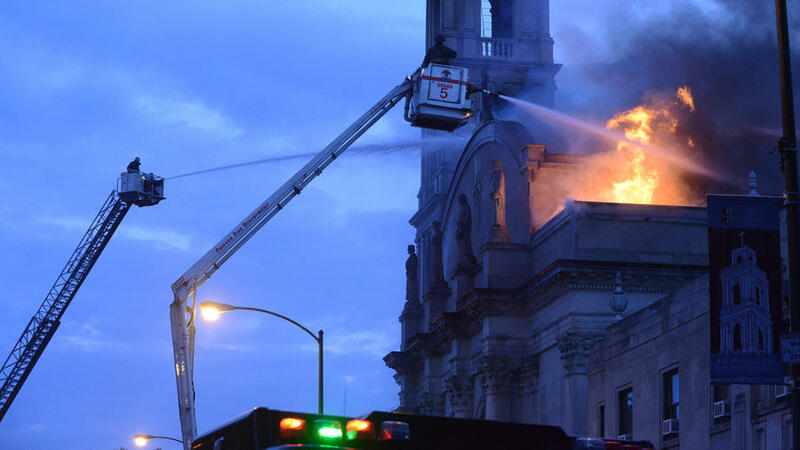 Please pray for all involved and for Traditional Catholics in the Archdiocese of Chicago. I'll share more as I know more. The fire broke out around 6 a.m. and was raised to a 3-11 alarm, sending 150 firefighters to the scene along with extra equipment to fight the flames shooting through on the roof, Langford said. Part of the roof collapsed but crews tried to save the steeple, Langford said. Around 8 a.m., officials on the scene said the fire was under control and it was struck out shortly before 9 a.m. The fire appeared to be accidental, and Langford said officials were looking into whether it was related to the work being done inside. Officials said workers had been varnishing in the church Tuesday night. Thank you also for asking what we might need. 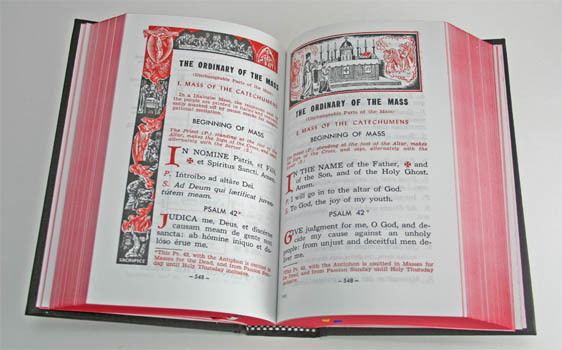 It is in fact second hand missals for the faithful that we need, whether they be Sunday Missals or daily Missals. New missals are extremely expensive here, since they have to be imported from the US, and the South African Rand is very weak. Many of our school students and African parishioners cannot afford missals, and would dearly appreciate having a Missal to follow the Mass, especially the children in the school who assist at daily Mass. 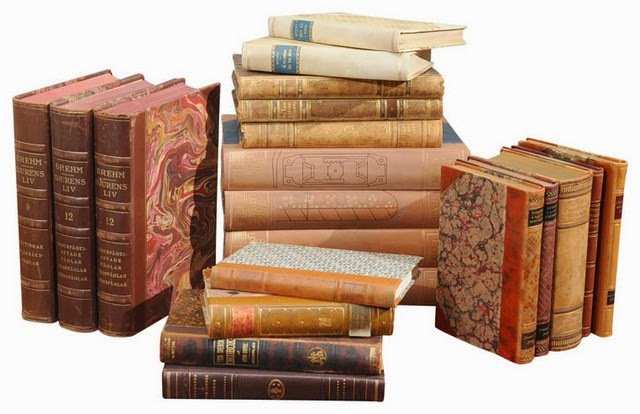 If you were able to locate any such second hand missals and send them to us, it would certainly be a very big help. It does not matter when they date from, provided that they are not after 1962. The children are so happy to be able to follow the Mass. If you can also ask around your friends and see if anyone else has second hand Missals that they are no longer using, it would also be helpful. Today in the pre-1955 Traditional Catholic Missal is the Mass in Some Places (pro aliquibus locis) of Saint Gregory the Illuminator (also called Saint Gregory the Enlightener). This feastday was set by Pope Gregory XVI in September 1837. 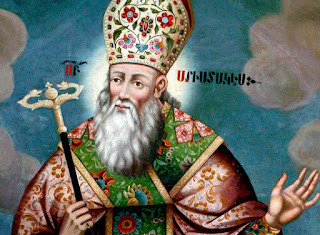 St. Gregory is the patron saint and first official head of the Armenian Apostolic Church. He was responsible for converting Armenia from paganism to Christianity in 301 AD. St.Gregory the Illuminator, an Armenian nobleman, is recognized for evangelizing Armenia so rapidly that Armenia became the first nation to adopt Christianity as its state religion. St. Gregory first converted the king, Trdat III (Tiridates), and with his support led massive “people movements” to Christ. This is the first case where a king's conversion led to the conversion of a nation. It preceded by a dozen years Constantine's edict of 313 whereby Christians were tolerated but paganism not banned, as it was in Armenia. 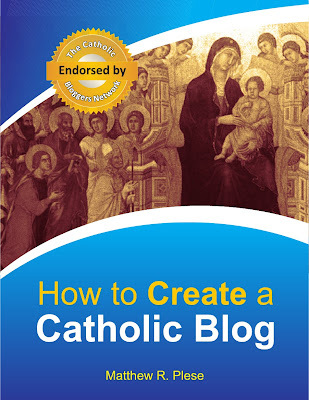 In honor of this feastday, spend some time learning about the Divine Liturgy of the Armenian Catholic Church. There are only a handful of Armenian Catholic Churches in the United States (view the full list here) - there are many more American Orthodox than Armenian Catholics.